The dates for Ulster's potentially crucial two remaining Champions Cup Pool 1 games against Saracens and Oyannax have been revealed. The Irish province will face pool leaders Saracens at Allianz Park on Saturday 16 January at 15:15 GMT. Ulster will then host struggling French Top 14 outfit Oyannax at Kingspan Stadium on Saturday 23 January (13:00). Prior to that, Ulster face Oyannax in their rearranged away game on Sunday 10 January, with a 13:00 GMT kick-off. That game was scheduled to take place on Saturday 14 November but was postponed after the previous night's deadly attacks in Paris. 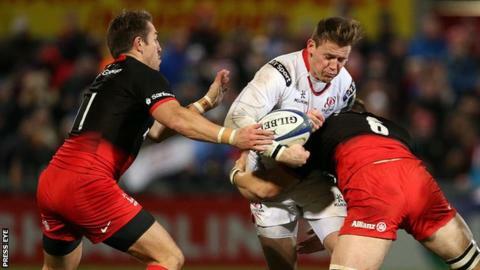 Ulster remain in contention for qualification for the quarter-finals of the tournament thanks back-to-back wins over four-times European Champions Toulouse, which yielded nine points. Les Kiss's side lie 10 points behind leaders Saracens, with that one game in hand.